On 2nd October, 2014, the Indian Prime Minister, Narendra Modi, launched a nation-wide cleanliness campaign on the occasion of Mahatma Gandhi's birth anniversary. The concept of Swachh Bharat is to provide sanitation facilities to every family, including toilets, solid and liquid waste disposal systems, village cleanliness, and safe and adequate drinking water supply. We have to achieve this by 2019 as a befitting tribute to the Father of the Nation, Mahatma Gandhi, on his 150th birth anniversary. Modi said that the Swachh Bharat mission is beyond politics, inspired by patriotism and not politics. He also asked people to pledge 'na main gandagi karoonga, na main gandagi karne doonga' (I shall not litter and won't allow anyone to do so). He further flagged off a walkathon as part of the Swachh Bharat Campaign, which is not just a slogan, but our responsibility. This turned the people's thoughts to Gandhi's idea of cleanliness. What is the need of it? How did Gandhiji influence and communicate this idea to the nation? To answer these questions it is necessary to know Mahatma Gandhi's views about cleanliness. Gandhiji dwelt on cleanliness and good habits and pointed out its close relationship to good health. No one should spit or clean his nose on the streets. In some cases the sputum is so harmful that the germs infect others. In some countries spitting on the road is a criminal offence. Those who spit after chewing betel leaves and tobacco have no consideration for the feelings of others. Spittle, mucus from the nose, etc, should also be covered with earth. (Navajivan dated 2 November, 1919). The Gandhi family was well known in Rajkot. His father and grandfather served as dewans (Prime Minister) in Rajkot and other neighbouring states. Being a Prime Minister's son and a barrister to boot, he must have needed guts to go round the town for a house to house inspection of the drains. Gandhi seldom failed to show moral courage when necessary. In his town, a mehtar (sweeper) called Uka did the scavenging. If Gandhi ever touched Uka, his mother, Putlibai, made him take a bath. Gandhi, otherwise a docile obedient son, did not like it. The 12 years old son would argue with his mother; "Uka serves us by cleaning dirt and filth, how can his touch pollute me? I shall not disobey you, but the Ramayana says that Rama embraced Guhaka, a chandal (a caste considered untouchable). The Ramayana cannot mislead us." Putlibai could find no answer for his argument. He criticized many western customs but repeatedly admitted that he learnt sanitation from the west. He wanted to introduce that type of cleanliness in India. Pointing to our unhygienic habits, Gandhiji strongly emphasized observing cleanliness in lavatories, and wrote "I shall have to defend myself on one point, namely, sanitary conveniences. I learnt 35 years ago that a lavatory must be as clean as a drawing-room. I learnt this in the West. I believe that many rules about cleanliness in lavatories are observed more scrupulously in the West than in the East. The cause of many of our diseases is the condition of our lavatories and our bad habit of disposing of excreta anywhere and everywhere. I, therefore, believe in the absolute necessity of a clean place for answering the call of nature and clean articles for use at the time. I have accustomed myself to them and wish that all others should do the same. The habit has become so firm in me that even if I wished to change it I would not be able to do so. Nor do I wish to change it" (Navajivan on 24 May, 1925). After a three-years stay in South Africa, he returned to India to fetch his wife and sons. Plague had broken out in the Bombay Presidency at that time. There was a chance of it spreading to Rajkot. Gandhi immediately offered his service for improving the sanitation of Rajkot. He inspected every home and stressed the need of keeping the latrines clean. The dark, filthy, stinking pits infected with vermin horrified him. In some houses belonging to the upper class, gutters were used as a privy and the stench was unbearable. The residents were a pathetic. Poor untouchables lived in cleaner homes and responded to Gandhi's pleadings. Gandhi suggested the use of two separate buckets for urine and night-soil and that improved the sanitation. During Gandhiji's second trip to India from South Africa, he attended the Congress session in Calcutta to plead the cause of the ill-treated Indians in South Africa. The sanitary condition of the Congress camp was horrible. Some delegates used the veranda in front of their room as latrines, others did not object to it. Gandhi reacted immediately. When he spoke to the volunteers, they said; “This is not our job, this is a sweeper's job." Gandhi asked for a broom and cleaned the filth. He was then dressed in western clothes. The volunteers were astonished but none came forward to assist him. Years later, when Gandhi became the guiding star of the Indian National Congress, volunteers formed a bhangi (sweeper) squad in the Congress camps where for once the Brahmins worked as bhangis. Two thousand teachers and students were specially trained for doing the scavenging at the Haripura Congress. Gandhi could not think of having a set of people labelled as untouchables for cleaning filth and dirt. He wanted to abolish untouchability from India. Whenever Gandhi got an opportunity to do a little bit of cleaning work, he felt happy. To him the test of a people's standard of cleanliness was the condition of their latrines. He described himself as a bhangi and said he would be content if he could die as a sweeper. He even asked orthodox Hindus to make him suffer social boycott along with the untouchables. In South Africa the whites despised the Indians for their slovenly habits. Gandhi inspected their quarters and asked them to keep their homes and surroundings clean. He spoke about it at public meetings and wrote in newspapers. Gandhi's house in Durban was built in western fashion. The bathroom had no outlet for water. Commodes and chamber-pot used by his clerks residing with him had to be cleaned. He compelled his wife Kasturba to do the same. He also taught his young sons this work. Kasturba once expressed her disgust when asked to carry the chamber-pot used by his caste clerks. Gandhi rebuked her and told her to leave the house if she wanted to observe caste bias. He was once socially boycotted by his own sympathizers for admitting an untouchable couple to the Sabarmati Ashram. Gandhi's group launched a mass contact programme in the villages. “At the end of the morning's march,” writes Tendulkar, “a batch of men and women from his party visited the Harijan quarters of the village near the camp, taking with them brooms and spades.” They talked about the “necessity of sanitation, about keeping their yards clean, of burying rubbish, instead of leaving it to blow here and there. 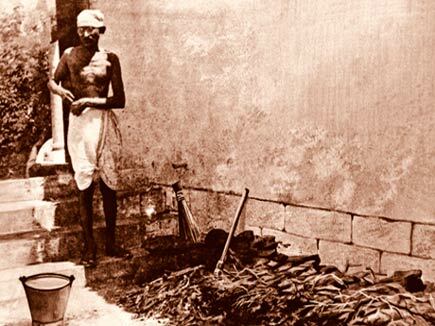 While Gandhi was engaged in talks, people who had accompanied him would begin cleaning up the basti themselves.They highlighted the need to prevent excrement lying in the open, as it attracted flies and spread disease. Even when talking about health and pointing out that disease could sometimes be traced to overeating or eating the wrong food, and therefore called forself-restraint, he did not fail to emphasise the need to educate villagers on hygiene and sanitation. The true function of the Ashram, he said, was to show people how they could avoid disease. Once, during his tour to promote khadi, the sweepers were not permitted to attend a public meeting where Gandhi was to speak. When Gandhi came to know of it, he told the organisers: “You may keep your purses and your addresses. I am going to have a meeting with the untouchables only. Let all others who want, come there." Two years before his death, Gandhi stayed in the sweepers' colony in Bombay and Delhi for some days. He wished to share the same lodging and partake of their food but then he was too old for the experiment. Gandhi once went to Shimla to have an important meeting with the Viceroy. He sent one leading co-worker to see the bhangi quarters there. He was told that they have reduced the bhangis to the level of beasts and that they earn a few coppers but only at the expense of their human dignity. “Look at a bhangi as he eats surrounded by filth. It is enough to break one's heart”. Neither temples nor other public spaces are free from filth. Neither leaders nor citizens are particularly engaged with the problem of cleaning up our cities and towns with genuine measures – reducing needless consumption, reducing waste, confining dirt to its designated place, cleaning up our riversand lakes and treating our environment with greater respect. In D. G. Tendulkar's Mahatma, Volume Three, there is a reference to Gandhi leaving for Orissa from Patna in 1934, as part of his harijan tour. At Champapurhat, finding that there was a dispensary on the grounds ofthe Gandhi Seva Ashram, he used that occasion to give a lecture on the need to rely not on medicines for a cure, but to prevent disease. After twenty years stay in that alien land, Gandhi, at 46, finally returned to India with his group. During his visit to Kumbh Mela at Hardwar that year, he with his Phoenix boys served as bhangis at the mela. The same year Gandhi visited the Servants of India Society's quarters at Poona. The members of the small colony saw him cleaning the latrines one morning. They did not like it. But Gandhi believed that work of this kind qualified one for Swaraj. More than once he toured all over India. Wherever and whenever he went, he found unsanitary conditions in some form or other and said that though few could afford shoes, it was unthinkable to walk barefoot in India. Even in a city like Bombay, people walked about the streets under the fear of being spat upon by the occupants of buildings around. The filth and stench of public urinal and latrines on railway stations and in dharmashalas were awful. Gandhi deplored the passengers' habit of dirtying the railway compartments. The roads used by the poor villagers and their bullocks were always ill-kept. He saw people taking a dip in a sacred pond without caring to know how dirty that bathing place or the water was. They themselves dirtied the river-banks. It hurt him to see the marble floor of Kashi Vishwanath Temple set with silver coins collecting dirt and wondered why most entrances to abodes of God were through narrow slippery lanes. In talking with municipalities, Gandhi often said; “I congratulate you on your spacious roads, your splendid lighting and your beautiful parks. But a municipality does not deserve to exist which does not possess model water-closets and where streets and lanes are not kept clean all the hours of the day and night. Have you ever thought of the conditions in which the sweepers live?" Gandhiji said, “So long as you do not take the broom and the bucket in your hands, you cannot make your towns and cities clean." When he inspected a model school, he told the teachers: “You will make your institution ideal, if besides giving the students literary education, you have made cooks and sweepers of them." To the students his advice was, "If you become your own scavengers, you will make your surroundings clean. It needs no less courage to become an expert scavenger than to win a Victoria Cross." The villagers near his ashram refused to cover excreta with earth. They said: "Surely this is bhangi's work. It is sinful to look at faces, more so to throw earth on them". Gandhi personally supervised the scavenging work in villages. To set an example, he for some months, himself used to go to the villages with a bucket and a broom. Friends and guests went with him. They brought bucketfuls of dirt and stool and buried them in pits. All scavenging work in his ashram was done by the inmates. Gandhi guided them. People of different races, religions and colours lived there. No dirt could be found anywhere on the ashram ground. All rubbish was buried inpits peelings of vegetables and left-over food was dumped in a separate manurepit. The night-soil, too, was buried and later used as manure. Waste water wasused for gardening. The farm was free from flies and stink though there was no puckka drainage system. Gandhi and his co-workers undertook sweeper's work by turns. He introduced bucket-latrines and bicameral trench latrines. Gandhi showed this new innovation to all visitors with pride; rich and poor, leaders and workers, Indians and foreigners all had to use these latrines. This experiment slowly removed a version for scavenging from the minds of orthodox co-workers and women inmates of the ashram. The sight of a bhangi carrying a night-soil basket on his/her head made him sick. He explained how with the use of proper instruments, cleaning could be done neatly. Scavenging is a fine art and he did it without becoming filthy himself. We can conclude that cleanliness is important in our life as well as for the nation. It is well known that the Mahatma Gandhi personally took the effort to achieve the change that he wanted to see. It is of course too much to expect our present day leaders to go around the cities with their rising number of slums, and initiate a genuine drive to clean-up the surrounding. It is even less probable that they will pull themselves away from their market-focused pursuits and ineffectual, exclusive pursuit of GDP growth, to focus on the task of nation-building. Teachers’ and students’ role is very important to create awareness on cleanliness. In today’s world the role of social media is important to create awareness among the people and inculcate a feeling of nationality among them. Cleanliness is not only the responsibility of the 'safaai kaamgar' (sanitation worker) or local government. It is the responsibility of all Indians. It is the responsibility of the Government officers, NGOs and the local community to make India completely clean. It’s a need of the present; all the people should actively participate to clean India to fulfil the dream of Mahatma Gandhi for the protection of the environment, for our safety, and for a healthy future.